All transactions are safe and secure with a reliable history in online purchasing behind each of our associates. 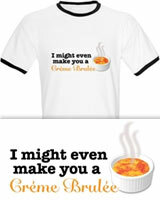 Buy the I Might Even Make You a Creme Brulee t-shirt to own High School Musical clothing and merchandise. Zeke Baylor (Chris Warren, Jr.) knows that the way to a girl's heart is through her stomach. His crush on Sharpay Evans (Ashley Tisdale) results in him baking her cookies. She comes around at the end of the movie, and she tells Zeke that his cookies are the best thing she's ever tasted. He suggestively responds, "I might even make you a creme brulée." The fronts of these High School Musical t-shirts display the movie quote next to a picture of the dessert. 40 merchandise items feature this design. In addition to the I Might Even Make You a Creme Brulee tee above, browse the High School Musical Clothing Gallery for more apparel like men's and women's clothes, kids shirts or hoodies.